ABC’s new show The Rookie has filled the void of a lack of dramedys. That’s what I like to call a drama that also makes me laugh. Go backstage with me on ABC’s The Rookie set with The Rookie Cast! Extra bonus is getting a personal tour from Mercedes Mason, who stars as Zoe Andersen. Thank you, Disney, for hosting me during the #ABCTVEvent. All opinions about my misguided rhyming skills are my own. We were given a list of The Rookie Cast that we would potentially see during our set visit to The Rookie. However, we encountered a little snafu with security on our way in. 25 bloggers trying to enter a set can sometimes cause confusion. So we were a little late. However, then in comes Mercedes Mason who is as sweet as can be. She had the day off and came in to talk to us about The Rookie. Seriously, you guys. How amazing is that? On her day off! While we were there, they were rehearsing, so we found a photo op in a Director’s Chair while we waited. Quiet on the set! Then Mercedes walked us around the set which was so cool! This was my 2nd TV show visit, the first being General Hospital. It’s crazy to see how the sets are built, how they can film everything in a small space, and see all your favorite locations up close and personal. 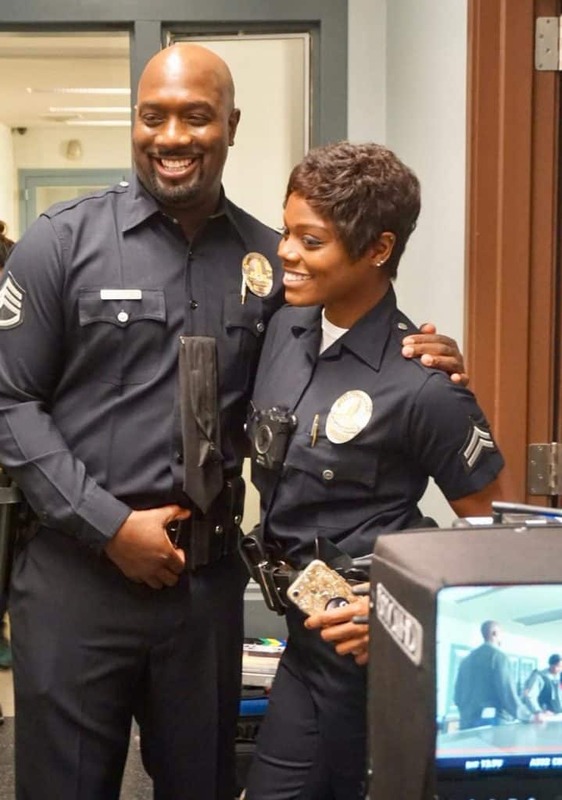 As we were walking we bumped into some of our favorites from The Rookie Cast – Afton Williamson, who plays Talia Bishop, and Richard T. Jones, who plays Wade Grey. I was dying laughing watching them interact with each other. You can tell there is definite love amongst the cast of The Rookie, and it shows on the screen, too. They were both kind enough to take selfies with us! Then we turn the corner and see Nathan Fillion, who plays John Nolan! I had interviewed Nathan during the Cars 3 press junket and already knew he was a cool guy. I have to laugh at how smitten I look in this picture. Then we got some more 411 from he and Afton. It was definitely special to chat with them on the set of the Police Station. Oh yeah, did I also mention we got a Nathan Fillion selfie? Yup. That happened. Mercedes took us into Sgt. Wade Grey’s (Richard T. Jones) office on the set! She is the Captain after all and can go where she pleases. I love her character on the show. She’s firm, but compassionate, and I love all the boss ladies. Then she told us about jokes on the set of The Rookie. We’re all taking a picture of this carton of water, because written on the side with Sharpie is “Richard smells like soup!” Also “he pees sitting down.” She’s laughing (and so are the rest of us!!) when retelling the stories of how she likes to raz Richard. She leaves notes like this for him to find. He’s a good sport about it. Even when I whispered “Richard smells like poo” as I walked by. Yeah, totally got it wrong. Soup, poo. Honest mistake. They rhyme, right? This was such a fun day on the set of The Rookie! Mercedes Mason is a wonderful tour guide and just a wonderful person. Get to know her character and others on The Rookie! My husband and I love to watch together, and it’s the perfect show for men and women. Something for everyone. What is The Rookie about? Starting over isn’t easy, especially for small-town guy John Nolan, who, after a life-altering incident, is pursuing his dream of becoming an LAPD officer. As the force’s oldest rookie, he’s met with skepticism from some higher-ups who see him as just a walking midlife crisis. If he can’t keep up with the young cops and the criminals, he’ll be risking lives — including his own — but if he can use his life experience, determination and sense of humor to give him an edge, he may just become successful in this new chapter of his life. I’m all about going after your dreams, and since he’s about my age, it hits close to home. I like to root for the underdog. Tonight’s episode of The Rookie is “The Hawke” – Nolan and the team must help capture a cop and his former mentor from the academy after he becomes a fugitive following an assault. Meanwhile, Officer Tim Bradford needs Officer Lucy Chen to learn to predict the moves of criminals in order to capture them. Some friends and I will be live tweeting tonight’s episode, so follow along on Twitter with #TheRookie! You can watch The Rookie on Tuesdays at 10|9c on The ABC Television Network or streaming or on demand.